Pakura [Edo Tensei] was a famous Kunoichi from the Village Hidden by Sand during the leadership of 4th Kazekage, Rasa. She was was killed through an ambush which was caused by betrayal. Pakura has an unique kekkai genkai where she is able to use Scorch Release which is a combination of Fire and Wind nature. 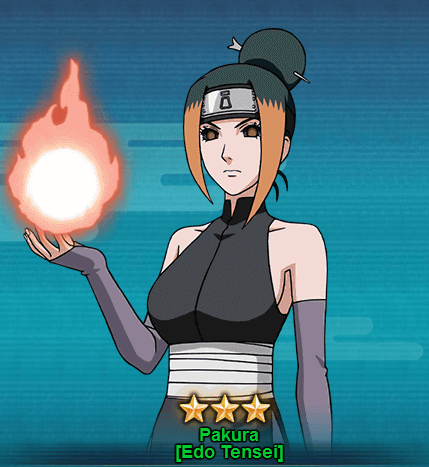 Let’s take a look at Pakura [Edo Tensei] abilities in Naruto Online game. Ninjutsu Scorch Style – Super Steam Kill [Prompt]: Causes Wind and Fire attributes damage and Ignition up to 6 of the opponent’s units. The selected unit will suffer Knockdown. Taijutsu Taijutsu Attack: Attacks the opponent’s units in the front row and ha highs chance of causing Low Float. Ninjutsu Unique Fuel: When this unit lands a Critical Hit, the affected unit will also suffer from Immobile, lasts for 1 round. The only way to get JPakura [Edo Tensei] is from the GNW (Great Ninja War) Treasure. You will need to draw at least 20-40scrolls to get Pakura . If you’re lucky you might draw her with lesser seal scrolls.